Getting Things Done! Coders Unite! Over the last few years I’ve contributed to, organized, worked with, and been in the audience of hundreds of user groups throughout Portland, Seattle, San Francisco, and Vancouver BC. By far, this area of North America has the most active, resilient, and density of thought leaders in the technology world. There is something missing however and I’d like to start working toward filling this gap. What’s missing you ask? Problem: People often get together and talk about tech, but rarely get together and do something about tech. The vast majority of user meetups end up as presentations. I must sadly say, often boring presentations that don’t really teach or demo all that much. Attendees often just come to talk afterwards or otherwise socialize, which is hugely important to the community. However there has to be a way more could be done. A better outcome would be to create a two way conversation, instead of the one way presentation, and to involve ourselves in creating solutions, new technology, and idea. In a few rare situations I have found groups that do something about this void. What’s their solution? Solution: They actually get together, implement code, pair, and work together on problems. Kind of like a Hackathon, but way more often. That’s what I’d like to create. To start off with, I’d like a group that is technology agnostic, is fairly skilled yet willing to pair and bring others up to speed, and simply gets together at least once per month to implement a specific project or effort that is predetermined by group submission and conversation (i.e. we’ll use a google group, e-mail list, or such). I think, and feel like there is enough support to get something like this started in Seattle, Portland, San Francisco (especially here), and Vancouver BC. My question is though, would you be interested in helping out, coordinating with me, and otherwise uniting coders to do more, learn more, and better themselves? 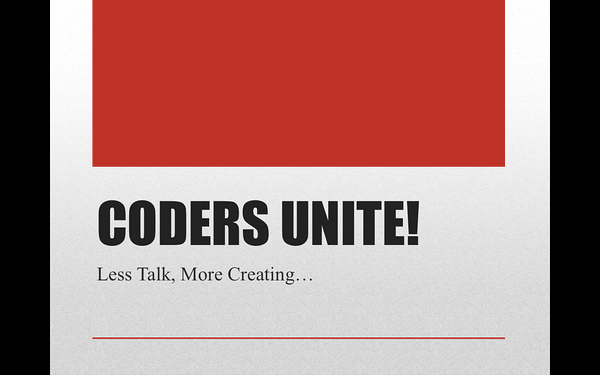 Is “Coders United” a good name for the group? What ideas do you have? Do you have a project or three or four that may be of interest for a group to get together and work on? This type of group would probably need to meet for more than an hour, would you be able to meet for 3-4 hours, maybe even on a weekend to implement a full project? What’s your preferred method of contact (e-mail, twitter, facebook, text message?) and how should I get in touch with you? This entry was posted in Coding Adventures, Ideas, Meetups n' Such, Presentations and Speaking, Software Projects, Software Teams and tagged coders unite, conferences, meetings, revolution on February 2, 2012 by Adron. I think this is a great idea and could really bring groups together. One thing to note is the project needs to be iterative and most likely open source to accelerate community. I have a couple of ideas for open source projects that would be fun if you want to ping me. You should come out to Seajure (the Seattle Clojure group) on the first Thursday of the month. We tend to massively pair on a small project with everyone SSHing into a shared Emacs session. I’ve been noshing on how to do group activities for PDX-UX. Stay tuned for our first workshop announcement. I considered some group coding but thought an evening might be too short, so we settled on something else. Your idea sounds like it could work though. I like the idea. 2 hours is probably the minimum time. I like evenings. I have an idea for a meeting project, feel free to ping me via email. 1. Name doesn’t matter 🙂 One additional idea would be to do concept projects based on technical learning. So, for example maybe someone is trying to understand how to use Mongo or Couch, and someone else wants to know how to set up a cloud server and manage deployment – so we put together a project that has those aspects so people can learn by implementation. 3. Full-day and multi-day sessions are prohibitive for those of us with families. Shorter sessions are better. I am 100% in sync with #1. That’s kind of what I’m envisioning at this point. Seattle had a project called 6 hour startup that met a couple of times a year to code a project on a saturday. to my knowledge it hasn’t been around for a while. their objective was to either build a usable product, or expand on past project. I think this could work if the objective is clear enough, and there are enough people so that it can be handed off. What if twice a year, we selected a non profit and built a solution for them. each week would be a sprint. we’d do major work together on the weekend, and do minor bug fixes in spare time during the week. when the sprint is over, you can opt out the following week and let someone else do it. so you only own the code during the current sprint. I remember finding out about and reading about these, I was bummed that they weren’t really happening anymore when I moved up here to Seattle. It sounds like something, with enough perseverance could really take off. Almost like startup weekends but with a much more technically minded focus. We’ve got some events like that in Portland, both the start up flavored ones and the non-profit flavored ones. Like Marty I would vote for shorter evening sessions. Two votes for shorter session. Got it. 😉 It’ll be super important to pair + TDD/BDD. I like the idea getting together to learn by doing, build up skills. I enjoy Startup Weekend but inevitably the emphasis shifts to ideas that help people spend time, rather than save time, and the tension for business model generally distracts from learning new code. My one draw back to I live 65 miles from Seattle and need to get bang for the travel buck, so a half day or full evening is necessary minimum. I hear ya on the travel. I’m now based out of PDX, so wherever it is, it’ll need to be a solid day of doing… or at last a solid half day minimum with clear goals. YES! This is a great idea. I live in the Columbia River Gorge, so I would answer to a Portland group. The name sounds fine – but maybe we could pair with @Pixelworkers and create a real-life version under their name… Just a thought. Twitter’s the best for me. @_crossdiver. Pingback: Coder Society: Vote, Group, Create!